Halloween: it’s for fun, families, parties and goodies. Which is wonderful, until the sugar lows hit, the tantrums emerge and the whole family is feeling worse for it. According to Catherine Burns, ‘the average trick or treater will come home with 600g of sugar…that’s approximately 15 teaspoons per child’! #1: Switch out that sugar with Susie Switch! Toxic Waste Mac N’ Cheese – A Bermy favourite with a spooky green twist! Low Carb Halloween Chips – A treat which all the family might love! Banana Ghost Pops Recipe – Just 4 yummy ingredients included! Your kids will want to keep some candy. We suggest letting them choose their favourite treats to keep and then encouraging them to think of a charity of their choice to donate the rest to, e.g. the hospital or an old people’s home. They will get to keep their favourites and learn about giving at the same time. After trick or treating is over, you will probably have some leftover candy…which is hard to resist. To help limit your indulgence, buy candy you and your kids don’t like too much to make it easier to give away. Your kids will be focused on filling their bags up, so buy small sized bags and that will help you to limit the haul. 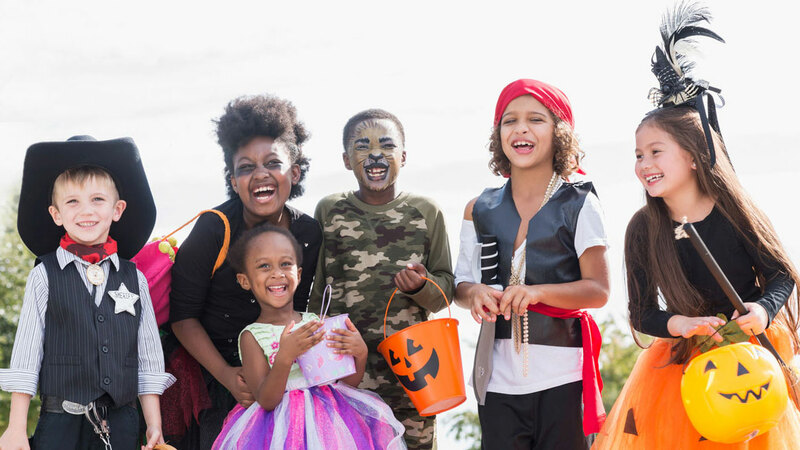 The great thing about Trick or Treating is that you’re on your feet…make this an exercise opportunity by challenging the kids to get round as many houses as possible and host fun activities like a zombie dance party or pumpkin toss that keeps everyone moving. You could even wear a fitness tracker as you chaperone your little ones around and set a steps goal for the evening! Above all, Halloween is about having fun as a family and enjoying life in balance. We wish you all a wonderful time…and for your decorations, treats (including healthy options) and costumes don’t forget to pop into People’s, we have it all! With thanks to the food bloggers and American Heart Association whose ideas helped to inform this post.